Intended as an aeroplano di combattimento, capable of fulfilling the roles of interceptor fighter, light bomber, or reconnaissance/attack aircraft as required, the prototype Breda Ba.65 made its initial flight in September 1935. Experience in Spain indicated that the Ba.65 was suited only to the attack role, and the type served thenceforth with most of the eight squadriglie attached to the two Regia Aeronautica assault stormi (wings), the 5� and 50�. 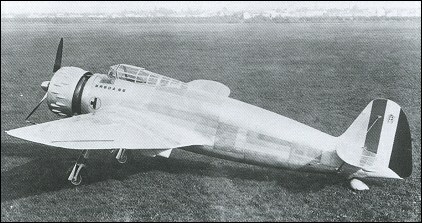 A second series of 137 aircraft was built by Breda (80) and Caproni- Vizzola (57), before production ended in July 1939. They differed from the first production batch by having Fiat A.80 engines. Six Fiat-powered Ba.65s and four more of the Gnome- Rhone-powered version were sent to the Aviazione Legionaria in Spain in 1938. Following Italy's entry into World War II in June 1940, Ba.65s were involved in the fighting in North Africa against the British. They had a low serviceability rate in desert conditions and put up an unimpressive performance, The last serviceable aircraft was lost during the British offensive in Cyrenaica in February 1941. A large number of the Ba.65s serving with Italian units were of two-seat configuration, with an observer/gunner in an open cockpit above the trailing edge of the wing. A smaller number of the type had a Breda L type turret, but in either case the observer/ gunner operated a single 7.7mm machine-gun. While offensive armament could theoretically comprise up to 1000kg of bombs, the load usually carried was up to 300kg in the fuselage bomb bay or, alternatively, up to 200kg on underwing racks. Exports included 25 Fiat-powered Ba.65 two-seaters to Iraq in 1938, two of them dual-control trainers and the remainder with Breda L turrets; 20 Ba.65s with Piaggio P.XI C. 40 engines to Chile later in the same year, 17 of them single- seaters and three dual-control trainers; and 10 Fiat-powered two-seaters with Breda L turrets to Portugal in November 1939. A single Fiatpowered production aircraft was tested with an American Pratt & Whitney R-1830 engine in June 1937 in anticipation of an order from the Chinese Nationalist government, but this failed to materialize. The Iraqi Ba.65s saw limited action against the British during the 1941 insurrection in that country. Developed from the structurally similar Ba. 64 (42 built, single or two seater), like many other multi-role airplanes of those years the Ba.65 was a failure, in all the three duties (interceptor, assault and reconnaissance) it had been projected for. As a fighter the main problems came from an extremely low climb rate (18� to reach 4.000 m. = 13,100 feet) and the long time the engine needed in the preheating phase, that prevented the airplane to be used for scrambles. In fact, tested in Spain, it was able to intercept and shoot down a single Tupolev SB-2. During that war he performed enough well in attack role, especially in dive bombing; but without air superiority (the situation he found in North Africa) it had poor chances of success. Its only strongpoint was the 4 x 12,7 mm. (0.50�) machine guns: that proved effective against armoured vehicles in low level assaults, in a confront with the results obtained by the obsolete fighters (C.R. 42 and G. 50 for the best part) converted to emergency fighter-bombers.